On Wednesday June 4th I will be giving a lecture at the Indian Institute of Management Bangalore (IIMB) at the Executive Post Graduate Program in Management on the topic of “Visual Communication for Managers”. 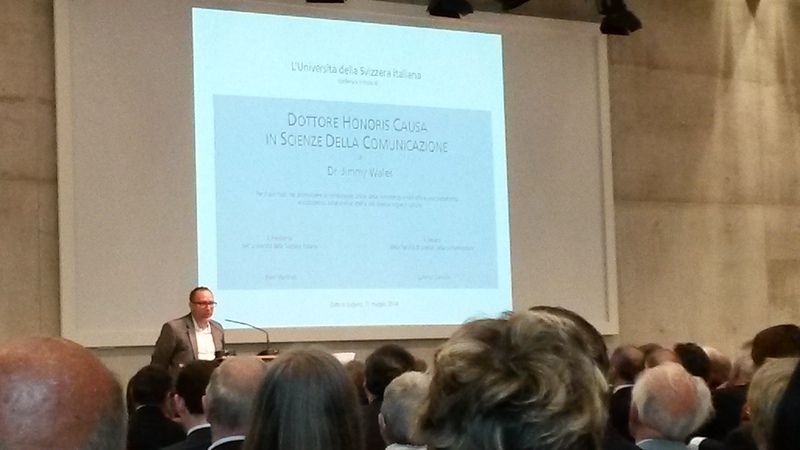 The Università della Svizzera italiana has awarded the 2014 PhD honoris causa in communication to Jimmy Wales, founder of Wikipedia and of Wikimedia. Wikipedia has become the largest encyclopedia int he world, and possible the first result you get on a search engine when looking for something! For this reason the faculty of Communication Sciences of the University of Lugano has decided to award Jimmy Wales a doctorate honoric causa. In his speech, Jimmy Wales commented on the future expansions of Wikipedia, explaning the importance of having content in the local langage of people from developing countries, who can now access the Internet thanks to affordable mobiles. You are currently browsing the Sabrina Bresciani blog archives for May, 2014.